We Can Guess Your Age Based On These 2018 Pop Culture Questions! Who was the victim of Cardi B's shoe throwing? Which of these royals did not get married in 2018? 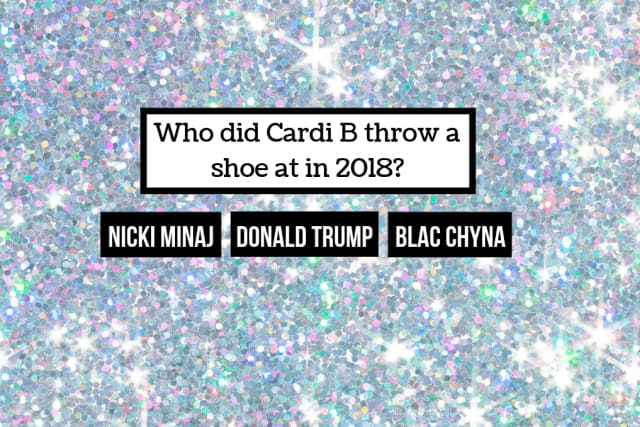 Who did Cardi B throw a shoe at in 2018? Which music icon passed away in 2018? Which of these celebrities did not get married in 2018? Which of these people did Ariana Grande NOT date in 2018? Who was Serena Williams playing against at the US Open when she got into a verbal spat with the tennis umpire? IHOP briefly changed its name to what in 2018? Which one of these movies did not command the box office in 2018? Who headlined the Super Bowl Halftime Show in 2018? Which Kardashian/Jenner did not have a baby in 2018?